McDonald’s Canada is holding a Get Ready to GO contest and you could win a getaway for 4 to Mexico or 1 of 14 flights anywhere in North America. The Get Ready to GO Contest is offered via the My McD’s app. Entering is easy, redeem any offer in the app or use mobile ordering. No purchase required. The contest ends at 11:59:59 p.m. local time October 9 2018. Open only to Canadian residents 13 yrs. and older. Click here for more details on this McDonald’s Canada contest. 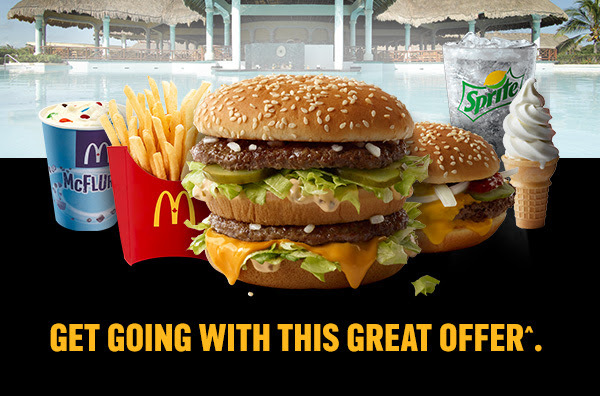 McDonald’s also has a great offer where you get $2 off any purchase of $10 or more. This offer is only available with My McD’s app. By the way… you can apply the $2 off $10 order on top of one of the mailer coupon offers (ie: the 2 can dine for $11.49 deal). I’ve done this 3 times the past 3 weeks running. Pro-tip: Dont ASK if you can do it because they’ll just say no without trying. Instead, just show the code on your phone just before you pay.